The spring climbing season on Everest and other big peaks in the Himalaya is proceeding on schedule. Most of the teams have now arrived in Base Camp on both sides of the mountain or will be there very shortly, and the acclimatization process is now underway. But before anyone can go up the mountain for the very first time, they must first complete an important step in the climbing process - the Puja ceremony. Those who follow the Himalayan climbing scene closely probably already know about the importance of the Puja. During this ceremony, a Buddhist lama comes to Base Camp and performs a ritual in which he asks permission of the mountain for the climbers to safely pass up and down its slopes. The lama will also bless the climbers themselves and the gear that they are using for the expedition. This is a long standing tradition amongst the Sherpa people and most will not proceed up to the higher sections of the mountain they are on until the Puja has been completed. It is not mandatory for the western climbers to attend the ceremonies, but it is part of the Himalayan climbing experience, so most do come and take it all in. Once the Puja has been wrapped up the teams are now free to start their climb in earnest. Several squads are at that point now, particularly on the South Side of Everest where climbers have been getting settled, making acclimatization hikes, and working on their rope skills for the past week or so. Some have ever gone into the notorious Khumbu Icefall where they've practiced climbing ladders and negotiating their way through that dangerous section of the climb. Reportedly, this year's route through the icefall is as direct, quick, and straightforward as any have seen before. Hopefully this will limit the amount of time spent in that section of the climb, which is widely considered the most treacherous on the Nepali side of the mountain. 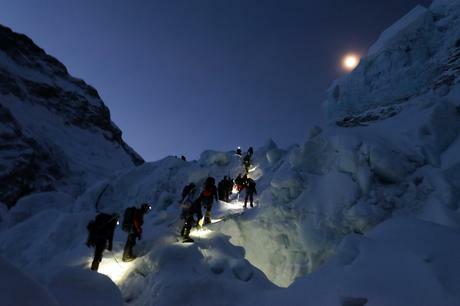 One of the first teams to pass through the Khumbu Icefall is IMG. The operator's Team 1 went up yesterday and arrived in Camp 1 for its first rotation. Today they'll climb higher up into the Western Cwm, before returning to C1 for a second night of rest there. It's all part of the plan to slowly get their bodies accustomed to the altitude over the next few weeks. British guide Tim Mosedale is leading his team into the icefall today too and they will make their way up to C1 as well. He reports that so far, the route doesn't seem all that busy or crowded, although that will change as more climbers arrive in BC and start heading up the mountain. Meanwhile, the Adventure Consultants have made their first foray into the icefall as well, but mostly just to scout the route and prepare themselves for the crossing. They'll actually head up to Camp 2 in a few days time, starting their acclimatization process too. Finally, The Himalayan News is reporting the numbers for the 2018 season in terms of climbing permits issued. According to officials, 649 permits have been issued this year for 22 peaks across Nepal. That includes 316 foreign climbers and 20 Nepalese on Everest, which is down some compared to last year. Additionally, the numbers for the other big peaks look like this: Annapurna I 1, Dhaulagiri I 26, Lho Tse 88, Makalu 27, Manaslu 8 and Kangchenjunga 42. A lone Korean climber on Annapurna is especially of interest. That's it for now. More news to come soon I'm sure.